This really is a game you need to take the rose tinted glasses off and NOT play, EVER. There is nothing here. Literally. OK, maybe figuratively, but the game is sparce. You get 8 real wrestlers, plus “yourself” and 3 fight modes and, a kind of career, but it is oddly a little hidden. 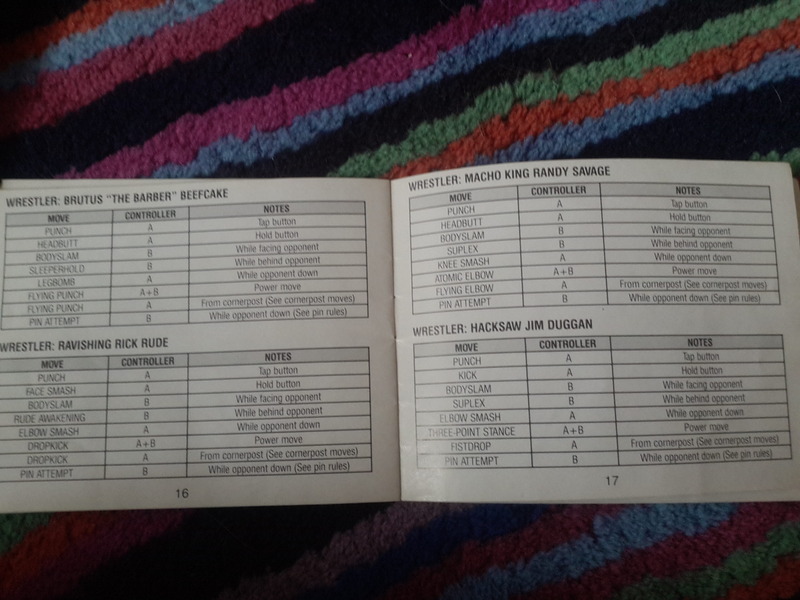 To do the career, you need to select “Yourself” and then you’ll fight all other wrestlers in order how how popular the wrestlers were at the time (SPOILER: Hulk Hogan and Ultimate Warrior are last). There is no attempt to shoehorn in a story, you just fight people in a row, one after another. It isn’t great, but it is standard for this era. The move set is BASIC! Punch, 1 forward grab, 1 back grab, a strong attack, a turnbuckle move, and a running move. Not everyone gets every move type, and each wrestler has slightly different attacks (so there is a little bit of variety). The game is actually fluid and responsive, the animations are good and the sprites recognisable (even on the wrestlers time forgot). You both get health bars, and when your health is empty, you’ll get pinned. All very simple. A bigger wrestling fan will have noticed earlier, but for the first 30 seconds of your fight the opponents entrance music plays (I only noticed when Real American was playing), they are actually pretty good so plus points for 8bit Real American/Warrior Wildfire. You’ll then get “generic game music”, but it is a nice touch, so I won’t be overly critical. This is bad, but not terrible. It succeeds in some areas, and lacks in others. I had originally written this with the intent of giving it 20%, but I thought I’d go back and play it again. It did improve. ‹ Double Dragon 2: The Revenge. Technōs Japan. (1988) Nintendo. I’m sure the game could have been better even on the NES. King of the Ring managed to at least do grapple followed by grapple moves, even if they were all the same. Really? Don’t remember that one! I’ll try and find a copy on eBay. I do remember a good one on the SNES, but don’t remember the name. I think you’re right though, it could (should) have been better. There was Super Wrestlemania, Royal Rumble, RAW and Wrestlemania the Arcade Game on SNES. King of the Ring was on NES and Gameboy. I had the sequel to Wrestlemania Challenge, which was Steel Cage Challenge. It was awful, especially buying and playing it after King of the Ring. They used the same animation (or non animation) for drop kicks as leg drops and elbow drops. You’d think they can have more animations to make up for far less backgrounds. Double Dragon and River City Ransom managed to have a lot of characters, simple animations and backgrounds. LJN is legendary for bad games. To think Rare developed Wrestlemania Challenge. All they needed to do was hire a guy to do sprites and another to I guess program controls. 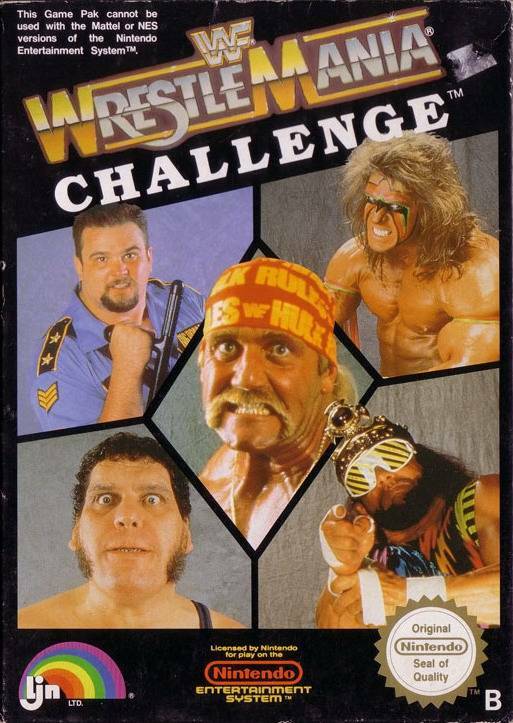 I’d love to see some home brew NES games attempt an old school wrestling game. Craig did a review of No Mercy on our blog, it is our favourite WWF game by a long way. You’re right about Double Dragon, it has so much depth to it, and a surprisingly large move set. Angry Video Game Nerd hates LJN, thought I would he fair on the first one… It is pretty sucky. Might have to adjust my score for it. No Mercy is a hellafun game unless you have the glitched one that loses your save file. Check out Virtua Pro Wrestling 2 for N64, it came out before No Mercy and that game was a lot of fun too even if there aren’t that many modes. I took a look for home brew wrestling / fighting games, couldn’t find anything. Sadly. I think the AKI method of controls can be used. B for attack, Up + B for a different attack, Down + B, holding B for a heavy attack. Tapping A to grapple, Holding A for a heavy grapple. In a grapple, use the A or B and direction pad for different moves per direction / button or both buttons. Double tap a direction to run or irish whip. Heck even Down + A to pick up a weapon, Up + A to throw it. I know I’m preaching to the choir here, but I’m just hoping someone will read, get inspired and do it. I’d hope that it wouldn’t take a year to program something like that like it did back in the 90s. I’m just a fan of the older school, because they could still do so much even with their limitations. I loved this game as a kid and it was big step up from its 1989 predecessor.